I enjoyed my junior and senior high school drafting classes. I also enjoyed flipping through issues of Model Railroader in the school library. These plans were drawn with the basics; pencil, triangle, compass, and ruler. As you can see, I did not learn how to plan a grade very well back then. I also liked drawing at one inch to the foot, which was problematic without an engineering scale. This plan was drawn just a few months later. Can you tell I grew up in coal country? Indiana County in western Pennsylvania was a decent coal producer through the 1970s and into the 1980s. The railroad name was pulled out of C&O country in West Virginia. Again, please do not attempt to build this layout. This plan was a portion of a larger, U-shaped 10×10 layout that I had drawn up. The other parts are lost to the paths of time. My track drafting skills have progressed as the track switches are closer to the proper angles, although still sharp. The grades remain a problem. I did not learn about rise over run for a few years. I actually built part of this layout. While undated, the drawing is from late 1978 or early 1979. It was my senior year of high school and I was becoming bored with my Atlas snap track plan from a book. The standard gauge track was handlaid around the perimeter but the narrow gauge rails were never installed. I used code 70 rail and made stub switches as I could not master points at that time. Somewhere in my archive, I have a photo or two of this layout. 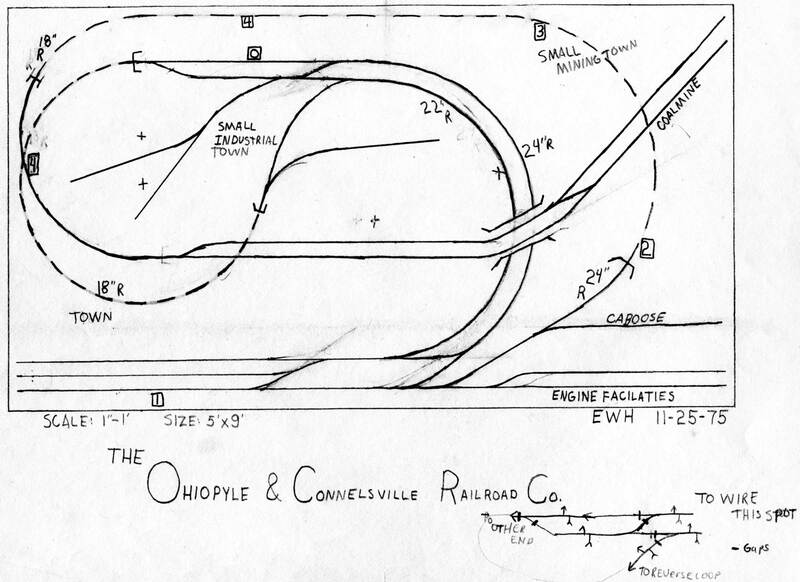 The standard gauge was the Indiana County Short Line, while the narrow gauge was the Tide & Western. Tide was a very small town just east of Homer City, and had a coal mine many years ago. I was a big East Broad Top fan back then, hence the narrow gauge addition. It’s interesting to review these efforts as I plan a new layout. These plans are incentive to push forward, and to avoid past mistakes! These are all nice concepts for age 14. To me, it indicates you were thinking switching and operating. At that age, point to point modeling was boring to me. 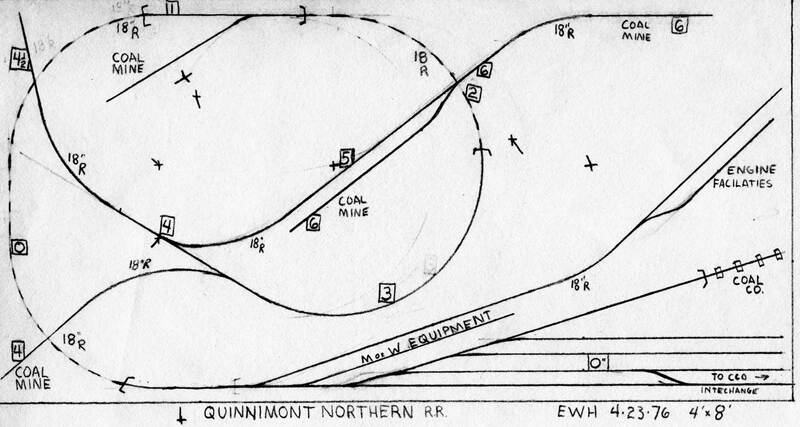 My model railroad ideas at age 14 were still mostly running trains round and round. Interesting perspectives over time. 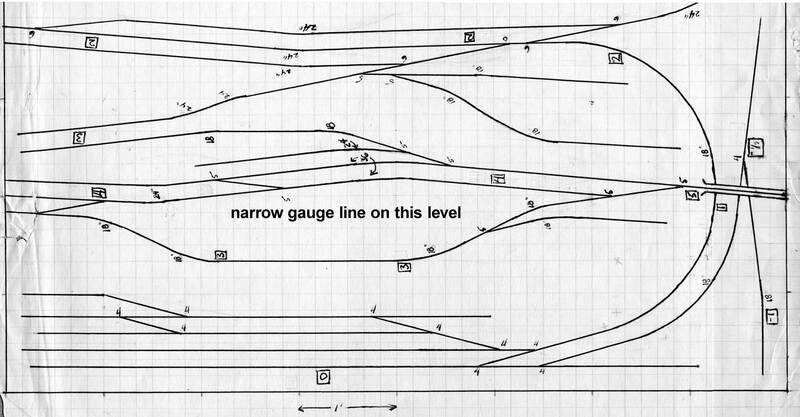 Is it my imagination or are there elements of plan #3 above (the standard gauge portion anyway) that survived/carried over into your Wheeling Freight Terminal layout? Certainly laid out in a U shape with a yard on one leg and switching on the other leg and the cross bar.